Over 40 years ago a paper presented two studies on overfeeding with a high fat diet. I was drawn to read this by wanting to see how it compared with Sam Feltham's experiments and to address the general question about overeating on a low carb diet. Five young (17-26) volunteers (3M/2F) were given a base diet for up to 45 days consisting of 168g carbohydrate, 64g protein and 39g fat. Mineral & vitamin supplements were used and tea, coffee and water permitted ad libitum. This is ~1280 calories/day and clearly not a low carb diet. 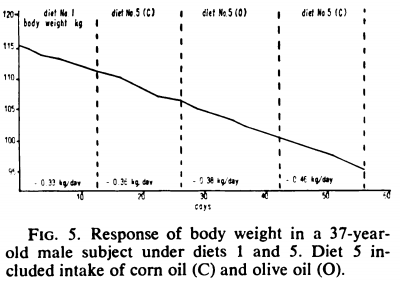 Corn oil (~45% linoleic acid - an omega-6 PUFA) or olive oil (~7% linoleic) were added to the base diet in stepwise increments every five days culminating in a fat intake of over 600g/day. The test subjects reported feeling a marked sensation of additional body heat at intakes of 300-400g/day and higher, and a marked tendency towards sweating. I guess this is how I feel after a large 5 course dinner and after 40 days the subjects were consuming over 6,800 calories/day. From the first two periods I'm going to guess that calories for weight maintenance were about 3800 and hence in the last 15 days the calorie surplus was just over 3000 calories per day. We're told 3500 calories is a pound of weight, so expected weight gain in the last 15 days was 0.85 lbs/day or 0.39 kg/day which is at least double the supposed effect of overeating by this amount. The paper reports that fat absorption was 94-98% occasionally dropping below 90% (from faecal analysis), but it certainly wasn't the 50% required to explain away the lack of weigh gain. This picture is worth a thousand words, showing a loss of body weight initially and a minimal recovery as the overfeeding progressed. If we were to take day 10-15 as representing maintenance at a very high daily calorie expenditure of 4100 calories then the last 10 days were at a surplus of 1850 calories/day from which we're led to expect just over 0.5 lbs/day or 0.24 kg/day of weight gain. The expected weight gain did not happen at all in the last 5 days and was at less than half the expected rate in days 20-30. 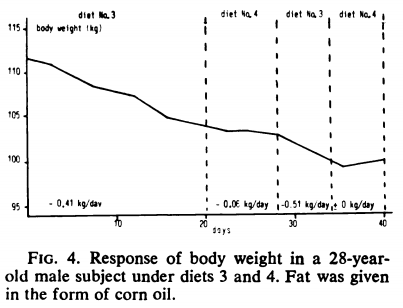 Only one subject overfed on corn oil regained any weight after the initial weight reduction that was observed in all subjects. The two subjects taking olive oil showed the curve of Fig.2 above with an initial loss followed by a regain. "weight gain did not correlate with the caloric intake. 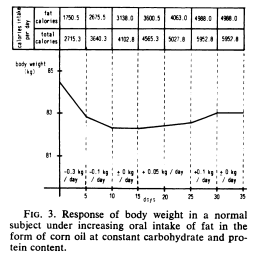 Particularly if fat was given in the form of corn oil, a distinct discrepancy between the caloric intake and the response of the body weight was detectable. This phenomenon was less conspicuous if fat was taken in the form of olive oil." Weight gain did not follow calorie intake, either at all or at the expected rate. Olive oil behaved differently to corn oil, giving greater weight gain but still falling short of normal expectation. Subjects reported feeling hot and sweaty at elevated oil intake, suggesting increased metabolic rate. High oil consumption was well tolerated with high % absorption. Based on this trial the authors went on to address obese subjects using a range of hypocaloric diets in general using corn oil as part of a high fat, low carb approach. 25 obese volunteers, age 20-54 years, were treated as inpatients using a variety of diets. Diet 1 was a typical commercial weight loss formula (Protein Sparing Modified Fast) with 43g/day of protein, 112g of carbohydrate and 26 g/day of fat. Total 855 calories per day with a carb:fat calorie ratio of 1:0.5. Diet 2 was 1000 calories a day of normal food, with 100 g/day of protein and a similar carb:fat calorie ratio of 1:0.45. Diets 3 & 4 were both 1700 calorie with low protein of 21 g/day. Diet 3 had 56 g/day of carbs with a 1:6.0 carb:fat calorie ratio, diet 4 reversed the carbs and fat to give a ratio of 1:1.5 with 156 g/day of carbohydrate. This diet is effectively half a portion of diet 1 supplemented with either oil alone (Diet 3) or oil and glucose (Diet 4). Diet 5 is a higher calorie option at 2100 cals/day with the same 43g/day of protein and 112 g/day of carbohydrate as diet 1. The fat:carb calorie ratio is 1:3.3 and in effect this just adds 136 grams of fat to diet 1. Diet 4 with isocaloric switch of glucose for part of the fat stopped weight loss. Diets 3 and 5 both produced a weight loss rate of ~0.30 kg/day (0.66 lbs/day). Diet 1 achieved a short term loss rate of 0.5 kg/day. Diet 2, the standard reducing diet, averaged 0.26 kg/day of weight loss. Diets 3 & 5 are more effective than the standard diet 2, despite much higher calories. Weight loss is better at high fat:carb calorie ratio. Substituting glucose for fat stops weight loss. There may be some water weight effects at work in Fig 4 with the possibility of increased glycogen and associated water when adding in 100g of glucose. The authors refer to the possibility of Diet 1 being low in sodium and giving an exaggerated weight loss as a result. In the full paper the individual variability and complex sequence and duration of diets can be studied. 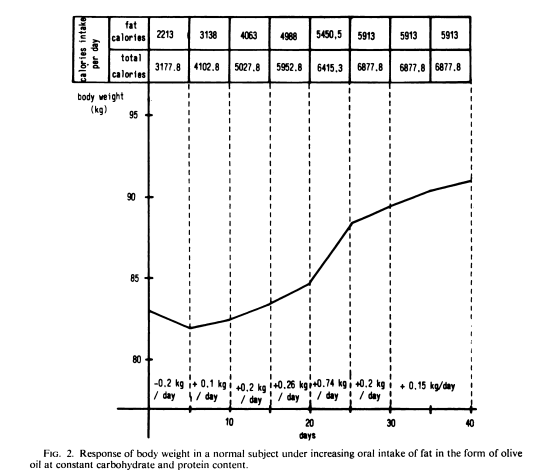 Response of body weight to a low carbohydrate, high fat diet in normal and obese subjects.